First established in the 1630’s by the French, who built a fort here and named it Pentagöet, the region was hotly contested amongst world powers at the time, all hoping to gain a tactical foothold on the area. Destroyed by the Dutch in 1676, 100 years before the fateful events that would create the United States, the fort lay in ruins. Today, the remnants of the fort have long since turned to dust and a Roman Catholic church now occupies its grounds. The former location of the fort marked only by an informational sign and a small plaque, its existence is now but a faint memory in history. By 1713, the land on which it once stood and the area surrounding it were annexed by the British Empire and would slowly build into a small community leading up to the Revolutionary War. By 1760 the earliest permanent resident, a man by the name of John Perkins, had settled here. Building a house, which still stands today and is located on the street named after him in town, he helped grow the community to around twenty homes by the time 1776 rolled around. Kept out of the conflict due to its remote location, British soldiers would not establish a presence there until 1779 when they built Fort George. The fort here holds a unique story and was the site of one of the colonist’s most humiliating defeats. The Penobscot Expedition was an operation so plagued by difficulties and setbacks one could even call it cursed. The US colonists could barely muster a proper attack against the relatively small and lightly defended British fort and were held back by bickering commanders who couldn’t agree on a proper plan, soldiers with incredibly poor combat training, and delays that kept piling up the more they attempted to organize the operation. In the end, the attack was an utter failure, one of the largest fleets ever assembled by the American forces was sunk in their attempted retreat with only one ship escaping, and the fort would stand until the end of the war. If you’re interested in learning more about The Penobscot Expedition, and how Paul Revere of the famous Midnight ride was involved, then the book “The Fort” by Bernard Cornwell is highly recommended reading and fleshes out more history of the Castine and Blue Hill area. Now, unlike Fort Pentagöet, much of Fort George’s foundations can still be seen today and a tour of the grounds is an experience not to be missed. All the details of this operation and more can be found at the Castine Historical Society and is a must-visit for any history enthusiast or for those that want to learn more about the area’s past. 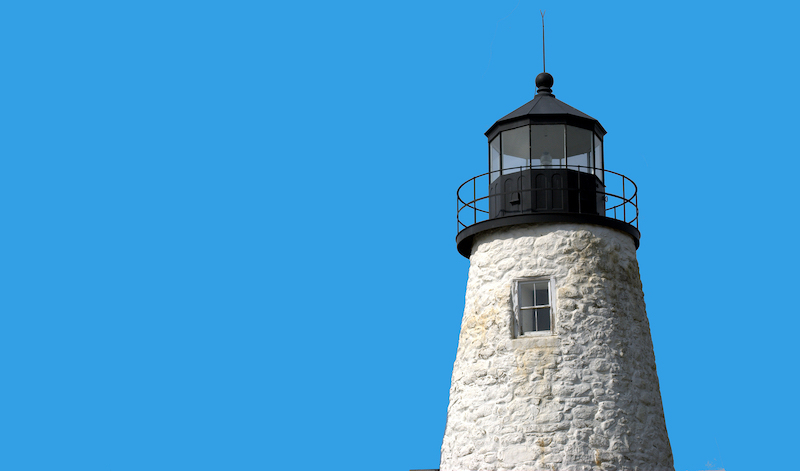 From the end of the Revolutionary war to the beginning of the Civil war was a time of great growth and prosperity for the town of Castine. Becoming a highly profitable harbor, the sea around the town was rich with fish and it soon became their main export. Built as the Customs House, the oldest U.S. Post Office continuously in service since 1833 resides in Castine. For a time Castine was home to the second busiest customs house after New York City. Due to its advantageous location, boats could reach the harbor several days earlier saving time, resources, and even lives, on a transatlantic journey. As the harbor grew and the town’s residents enjoyed this new prosperity, many merchants settled down and led lavish lives in the now wealthy city, their legacy surviving to today in the form of streets named after the merchant families and the large, extravagant homes that line Main Street, Court Street, and Perkins Street. 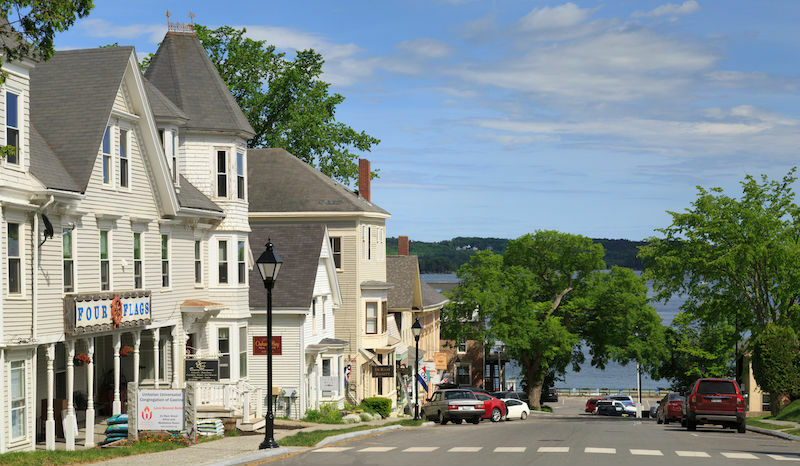 A walk downtown in Castine can feel like stepping back in time, a distant echo of what was once, according to one source in 1850, the second wealthiest city in the United States. A statue dedicated to the 157 men who left to serve in the Civil War was erected in 1881 to honor their memory and it can still be seen today on the town commons. Around the time of the Civil War, the area’s economy changed as fishing boats gave way to steamboats bringing in tourists or “rusticators” as they were called at the time. 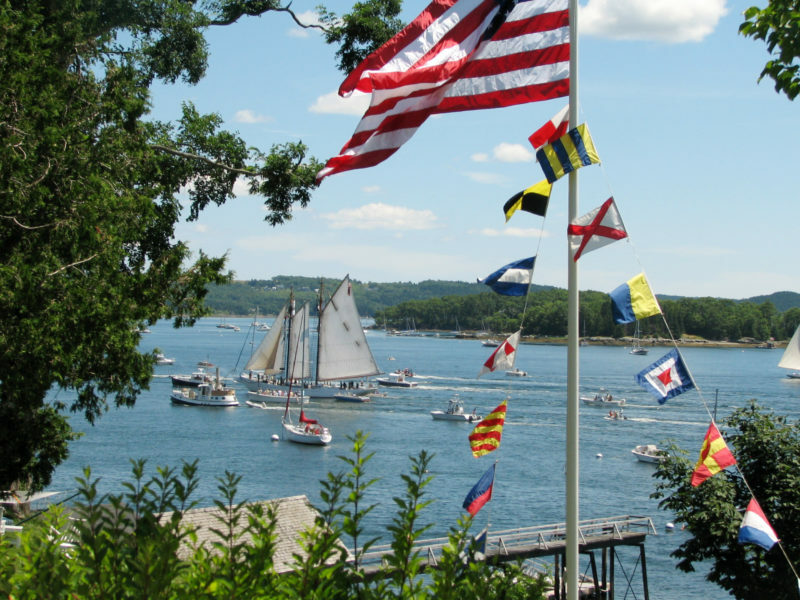 Coming to Castine to stay at the numerous luxury hotels and pastoral summer cottages, the tourism industry boomed and brought even more wealth to the now popular destination known throughout America. Though to those who lived in, it might have seemed like it would last forever, all good things eventually come to an end. By the 1920’s, the nature of transportation had changed. America was no longer getting around by steamboat or train and the age of the car had begun. Slowly forgotten by the rest of the world, Castine slipped back into the obscurity it once knew so well. The once lavish hotels that attracted so much wealth in the 1880’s and 90’s were abandoned and torn down. Today only a few remain, a faded memory of a distant time. Conflict would once again bring attention to the small town when the US entered World War II in 1941. Spurred on by a need to strengthen our forces at sea, the Maine Maritime Academy was established in Castine that same year and would breathe new life into the area once more. To this day the Academy’s training ship, the TS State of Maine, is still docked in the harbor most of the year. Castine now serves tourists once more, much of the older historical houses now restored to their former glory by residents. And a visit to the Wilson Museum on Perkins Street is a must for any history buff. 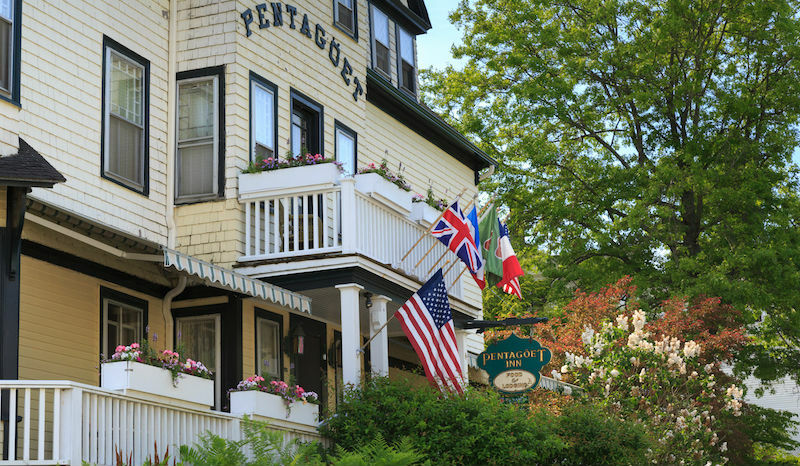 Named after the original fort which began the town’s history all those centuries ago, Pentagöet Inn is steeped in the unique history of the area in its architecture, design, and core ethos. Originally built in 1894, the Inn currently occupies one of the few hotels from that time and is the oldest currently surviving hotel still standing in town. With a place so physically connected to the history of the area, it’s no surprise that the interior of the inn follows suit. All throughout the Inn, authentic pieces of history can be found, brought back from various travels abroad and reflect the cultural exchange that would have once taken place in the bustling harbor of days past. Nothing on the property reflects our historical roots more than The Baron Pub and Wine Bar. Featured on the Travel Channel, a drink inside can feel like stepping back in time. Covered floor to ceiling in history, the bar contains an eclectic mix of antiques, treasures from faraway lands, and vintage photographs and paintings. For the history buff who just can’t get enough, unwinding with a drink at the Baron Pub is the perfect way to end a day out on the town taking in the area’s unique and storied past. A visit to our Inn is a fantastic way to truly immerse yourself in Castine’s rich past and we hope that this little taste of the town’s history has encouraged you to come and pay us a visit. Much like the tourists of old who would stay here at the hotel, we hope to also see you come and experience us for yourself!